What is SEO and why is it important for your business? Search Engine Optimization (SEO) refers to the method used to increase a website’s position on search engine results pages (SERPs) on sites such as Google, Yahoo, or Bing. Developing an SEO strategy for your business can help draw consumer traffic to your website as well as grow your sales and revenue. To get you started on your SEO strategy development, here is a little background to understand how search engines, such as Google, use metrics to rank organic search website placements. The goal of a search engine is to provide unbiased results that deliver information you are looking for as quickly and as accurately as possible. In order to do this, search engines are capable of identifying all relevant information online and ranking them in order of quality and relevance. There are hundreds of factors that are involved when search engines rank websites in an organic search. Amazingly enough, they can analyze billions of pieces of data in as fast as 0.5 seconds! The actions you take to optimize your site will have a direct effect on your SEO ranking. Components such as H1 tags, the words used in your website meta description, content and keyword density, permalinks, and backlinks are some of many things that you can leverage to boost your ranking. H1 Tags: These are the larger headers you use to title your content. For example, the H1 for this article would be the title, ‘What is SEO and why is it important for your business?’. This article page may surface on the google search results when someone searches for keywords that are present in the H1 tag like ‘SEO’ and ‘business’. Make sure your H1 tags are relevant to the keywords you want to be showing up for. Keyword Density: This is the amount of times that the keyword your audience is searching for appear on your website. Make sure to mention your keywords, not only in your H1 tags, but also in the body of your content. While you want to include your your keywords often, don’t oversaturate your content. Remember, Google will also consider the use of synonymous keywords. Permalinks: This refers to permanent URL links that are specific to your website. It is advantageous to include your keywords in these permalinks in order to be considered for higher ranking on Google. For example, if you have a gardening website and want your consumers to find the keywords “lawn products,” it would be optimal for you to have a page with a permalink such as: http://www.gardening.com/lawn-products. Backlinks: This is when other websites link back to yours by providing their viewership with your website URL. For example, if Forbes mentions your business on their website and includes a link for their readers that leads back to your website, this would be considered a backlink. The more of these you have, the better your opportunities are to be higher ranked in your keywords. However, the source of your backlinks also play a factor in ranking. Google values quality and the bigger the source your backlink come from (ie. Forbes, NY Times, .gov addresses etc.) the better chances you have for being ranked higher in your SERPs. Be advised that buying backlinks from websites is considered ‘black hat SEO’ and is not recommended. SERPs on desktop vs mobile: Is your website mobile friendly? If your business has expendable revenue, achieving that #1 spot on a search engine can be money well spent. The image below identifies the advertisement sections where you can bid for certain keywords and be placed above the organic searches. 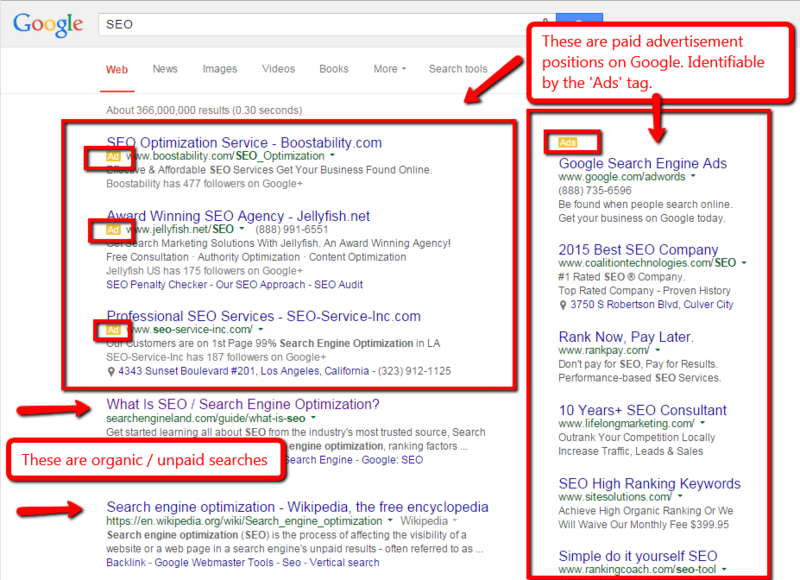 Remember that google also prioritizes these paid ranking advertisements as seriously as their organic searches. The more relevant your website is to the search keywords, the better positioning you will get and possibly cheaper pay per click pricing. Be advised that certain keywords can be more expensive than others. Make sure to budget appropriately. Getting placed on the first page of a Google search doesn’t happen overnight. Your SEO strategy needs to be a continuous process. As technology develops, search engines also adapt to these changes by altering their algorithms that define how you website gets ranked. Stay on top of your SEO strategy and make sure that it is up to date. Your SEO strategy will go a long way for you and your business with the proper maintenance. Not only will you have your current customer base, but you can passively accrue traffic to your website by being present in the top 5 searches for your keywords. Customers will be able to find you and your business easily when looking up relevant information that pertains to your business. A good rule of thumb to keep on top of your SEO strategy is to research the tactics used by your competitors. Google your own keywords and see who places in the top 5 searches then analyze their websites to see how and why they are being placed in the top rankings. By working on the components mentioned in this article and via our partner HowToStartABlog101.com, you should have a good head start on boosting your rankings. This entry was posted in SEO on June 25, 2015 by Michelle Galvez. Exceptional issues listed here. I’m very thankful to seem the content. Thank you a good deal with this particular looking forward to speak to anyone. Are you going to kindly decrease me a mail?